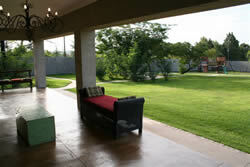 A spectacular new party venue situated in the country near Broadacres Shopping Centre. Relax in our indoor lounge area, large enough to accommodate the whole party, or on the lovely farm style patio overlooking rolling lawns with views of the Magaliesburg mountains in the distance. We can also accommodate conferences, small weddings and any other family functions.